This article is about the suburb of Glasgow, Scotland. For the 1980s band, see Easterhouse (band). 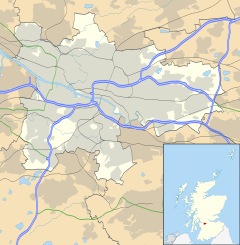 Easterhouse is a suburb of Glasgow, located approximately 6 miles (10 km) east of the city centre, partially built on land gained from the county of Lanarkshire as part of a boundary expansion of Glasgow prior to the Second World War. Building began in the mid-1950s by the-then local authority, Glasgow Corporation. The goal was to provide better housing for the people of the East End living in sub-standard conditions. The area is on high ground north of the River Clyde and south of the River Kelvin and Campsie Fells. It was built to house over 50,000 people but as of the 2001 UK Census, its population was 26,495, of which 96.85% were born in Scotland. 172 people or 0.63% of this population were born outside Scotland, the lowest percentage in the country. In 2011, the population of Easterhouse decreased to 8,923 based on a narrower definition of the area and regeneration of housing which replaced tenements with houses. Neighbourhoods considered to be part of Easterhouse include Wellhouse, Easthall, Provanhall, Kildermorie, Lochend, Rogerfield and Commonhead. The nearby communities of Barlanark, Craigend, Cranhill, Garthamlock and Ruchazie were constructed during the same period using the same general building principles. The remains of crannogs from the Iron Age were found in Bishop Loch, dating from around 700 BC by an archaeological dig in 1898. The Bishops of Glasgow were granted the land on which much of modern Easterhouse was built when the church of Glasgow was elevated into a bishopric in the 12th century. The remains of the Bishop of Glasgow's country palace have been revealed by the West of Scotland Archaeology Service next to Bishops Loch (a Site of Special Scientific Interest (SSSI)) at Lochwood. The palace was called Lochwood Castle and was demolished after the reformation to build a mausoleum at nearby Bedlay Castle, which was in turn dismantled and the stones reused as a lodge in the early nineteenth century . Local oral history talks of the Bishops of Glasgow sailing in a Venetian gondola from Glasgow Cathedral to his palace at Bishops Loch. Hogganfield Loch is the source of the Molindinar Burn next to the Cathedral, so some truth may lie in this claim. The Forestry Commission administers land around Easterhouse under the name 'Bishops Estate', thus maintaining a link to the medieval bishops. The far western and far northern parts of modern-day Easterhouse are believed to have been administered by the prebends of Barlanark, called the 'Lands of Provan' but the boundaries of this has never been accurately defined. The 15th century mansion house, Provan Hall, is a reminder of this ecclesiastical Pre-Reformation Papal administration. The southern and eastern parts of the area, Bartiebeith, Blairtummock, Dungeonhill, Easterhouse, Hallhill, Netherhouse and Commonhead were also part of the Bishopric although granted by Malcolm IV to the Monks of Newbattle a little after 1162 in an unnamed charter by permission of Bishop Herbert of the See of Glasgow. The lands remained under the monks until 1268 when Bishop John de Cheam (Cheyam) redeemed the 'lands along the Clud' (Clyde) called Kermyl (Carmyle) - most of the area now comprising modern Easterhouse were included in this grant - to sustain three chaplains to 'minister for the salvation of the Bishop's soul and also for the souls of all the faithful deceased'. Easterhouse has always had a poor reputation in Scotland and the UK as a whole. Easterhouse's reputation is partially due to riots in the 1970s that started there and spread to surrounding areas such as Garrowhill and Barlarnark. Another factor negatively affecting the area's reputation is that it consists mostly of council estates. The crime problems in Easterhouse and as many surrounding areas in Glasgow's East End is often associated with "Ned" culture. Easterhouse is famous for having a gang problem, though not in the traditional sense. Many members of said gangs have stated that there are no leaders, no money and no narcotics involved but fighting between gangs is purely territorial. These gangs are often fuelled by alcohol which is often a large problem in working-class areas of Glasgow although, perhaps, most prominent in Easterhouse. This is due to the drinking culture and availability of cheap beverages such as the infamous Buckfast. Drugs are also a problem in the area, as many people have died of drug-related causes; most notably of heroin overdoses. However a charity formed in 1991 called "GEAAP" (Greater Easterhouse Alcohol Awareness Programme) has tried to improve the alcohol problems of the area. Their main aims are to get any child victim of alcohol abuse to speak out which they have done by collaborating with local schools such as Garrowhill Primary School and Bannerman High School another important part of the charity is to help alcoholics overcome their addiction. The gangs have been formed by young, unemployed young adults in Easterhouse whose complaints are that there is nothing to do in the area, so drinking goes on throughout the day until erupting into violence at night. The gangs are numerous in Easterhouse and there are about sixteen in a 6½ mile radius such as: the Provy in the centre of Easterhouse, or the Anarchists in Easthall. All sixteen gangs come from a different housing estate which is where they will stay to avoid conflict. the gangs are not exclusive to Easterhouse, but Easterhouse is the main concentration in the area. The area maintains a sub-par life expectancy, a high crime rate, and average pay in the area; significantly lower than the British average. Easterhouse's reputation does nothing to help it reform as today, it is still seen as a poor and violent place. Recent attempts to improve the areas image include: the construction of the Bridge, a public library and a swimming pool attached to John Wheatley College. In Timothy Pont's map and manuscript of 1596 the area where the late 19th century village of Easterhouse later developed was called 'Conflat'. Variations of this name are contained in the rental book of the Baronie de Glasgow (1513–1570) when it is recorded that one 'Johannes Woyd (John Wood) was rentaller of the 18s 8d land of Conflattis. The William Forrest map of 1816 calls the area of the old village Wamnat. Like the nearby village of Whifflet, now in Coatbridge, the term conflat derived from corn/wheat flats - flat land where wheat was farmed. The village of Easterhouse was built from the late 19th century in land owned by, and south of, a farm of that name, in the immediate area around where Easterhouse railway station stands. The village was bounded to the north by the Monkland Canal and to the south, almost continuously with, the village of Swinton. Contrary to the stained glass window in Morrisons, Glasgow Fort, the villagers worked in a number of industries including the canal, the stone quarry at Auchinlea, coal mines at Gartloch and Baillieston but mainly in the surrounding farms and estates as agricultural workers. Some cottages and other buildings (now a public house) can still be found on and adjacent to Easterhouse Road that were part of the 19th century village of Easterhouse. A modern corruption of the ancient Conflats name can be seen at Whamflet Avenue in Easterhouse village. The village's name was derived from Easterhouse Farm. Easterhouse farm was opposite (to the east) to the farm called Westerhouse. Easterhouse farm was located on what is now Millennium Court and Westerhouse near where Errogie Street now stands (off Westerhouse Road). A small group of remaining trees are still present lead to the site of the farm buildings. Other farms in the area included Westerhouse, Netherhouse and Dungeonhill farms, these names are still found in local street names). Other farms, villages and country estates included West Maryston (or Merryston), Queenslie Farm, Netherhouse, Provanhall, Blairtummock and Lochwood. Auchinlea and Blairtummock parks both contain listed mansion houses. Provan Hall (or Provanhall), a category A listed building owned by the National Trust for Scotland is the best-preserved medieval fortified country house in Scotland. The house stands on its own grounds on the edge of Auchinlea Park. The building dates from before 1460 and is one of the oldest in the Glasgow area. The original doors lead into the kitchen, a dairy and a hallway. The kitchen boasts a fireplace capable of roasting an ox and has one of the finest examples in Scotland of a Roman style barrel vaulted ceiling. The cross vaulting in the dairy ceiling is medieval. On the upper floor, the dining hall contains an ancient oak table and dumbwaiter. There is a collection of historic chimney pieces. The hall may have been visited by Mary, Queen of Scots while her husband, Lord Darnley was ill in St. Nicholas Hospital (Provand's Lordship) in the late 16th century. Provan Hall has a boundary wall dating from 1647. The coat of arms of the Hamilton family, which at that time owned the estate, is found above the entrance arch of that wall. Across the courtyard to the south is Blochairn House, which today is occupied by the Greater Easterhouse Environmental Trust. Thought to have been built around 1450 Blochairn House was remodelled in 1760 by John Buchanan, a Tobacco Lord, to resemble the plantation house on his Jamaican tobacco estate. Both Blochairn and Provanhall are category A listed by Historic Scotland (1970). The houses were served by the now Provanhall Loch, now artificially banked and part of Provanhall Park. A formal parterre garden is to the north of both listed buildings. Provanhall is now the headquarters of the local preservation trust. Blairtummock House and adjoining walled garden and garden house is category B listed (1990). The garden pavilion was created from a demolished Robert Adam house on Queen Street, Glasgow. The house was built in at least five phases, late medieval (1580s), Georgian (1721), Victorian (1830s) and minor alterations in the 1960s and early 2000s. The name Blairtummock comes from Scottish Gaelic blair meaning flat area and tummock meaning hillock, so a flat area on top of a small hill. This describes the Easterhoue areas as a whole, the raised area Strathkelvin drops into Strathclyde. As the house was enlarged, the farm land surrounding the house was developed into an estate and when the Blairtummock estate and house was purchased from the Lamberton family in 1954, for development of housing, it consisted of 103 acres (0.42 km2). The Lamberton family owned the Lamberton and Co Ltd engineering steel works in Coatbridge. The Lamberton and Co Ltd works (from 1870) are now listed buildings themselves. The house and gardens were restored in 2008-09, partly as offices by the GEDC (architects, Simpson and Brown, 2006). The restored building includes a modern extension replacing the 1960s alterations, so adding a fifth phase of building. The walled gardens have had the original parterre restored. The tree lined drive way to the house has been resurfaced and additional planting has restored the parkland setting of the house. St Benedict's Church (Gillespie, Kidd & Coia 1962-65) is a prominent example of modernism. It was category B listed in 1994 together with the adjoining Presbytery The church was renovated in 2005-06, given a new copper roof and function rooms. The church was built on the site of Craigend Cottage. The woodland surrounding the church, Craigend Wood, is named after this cottage and farm. Other modern architecture includes the Easterhouse Health Centre (Davis Duncan Architects (Archial) 2002) The Bridge (Gareth Hosins Architects, 2004), Wellhouse Community Centre (Chris Stewart Architects, 2004) and a new College building. The Bridge was short-listed in the RIAS Awards, and won the Design Award from the Glasgow Institute of Architects. The Bridge was highly commended at the Scottish Urban Regeneration Forum awards in the Partnership category. The Bridge is a constructed over the waste ground which lay between John Wheatley College's new campus opened in 2001, and the Easterhouse Pool, realising local ambitions for a 'cultural campus', including Visual Statement (Dance Company), Scottish National Youth Theatre and Easterhouse Library, and forms an extension to John Wheatley College's Easterhouse campus, housing some its recording facilities. Glasgow Fort, built on the grounds of Provanhall house and park of the same name, is a large, semi-circular, traditional street style shopping centre. Public art installations include a Clydesdale horse and a Phoenix sculpted from galvanized steel by Andy Scott. 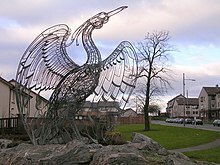 The Phoenix was designed to represent the regeneration of the area and is located in a prominent location on Easterhouse Road, in the grounds of the old Easterhouse Farm. The Easterhouse mosaic (1982-84) is located on Lochend Road. It covers 1,500 sq ft (140 m2), making it the UK's biggest hand-made mural and one of the largest in Europe. Large-scale building commenced in the mid-1950s by the Corporation of Glasgow, replacing farms and country estates, to provide housing for city residents living in sub-standard accommodation in the city. The old village of Easterhouse was not developed with the new estate and declined. The old railway station was demolished (later replaced with a modern station building), together with a small number of the houses. The 1950s-1970s housing was an improvement from the tightly packed tenements that many people moved to Easterhouse from. These tenemented dwellings had double bedrooms and interior bathrooms with a lavatory. The population peaked at over 56,843 in the early 1960s and is now around 26,000. The 2008 Scottish Public Health Observatory report on life expectancy, smoking levels and unemployment show that Easterhouse has lower levels of life expectancy and higher levels of smoking and unemployment levels than Scotland, though both of the latter are falling by large percentages. The 100,000th council home to be built in Glasgow was part of a three-storey block of flats in Carriden Place, Easterhouse; it was completed in 1965, 46 years after the first council houses in Glasgow were built. Easterhouse, along with other large housing projects built at that time by Glasgow Corporation, came to prominence in the wider world through its social problems and became a case study for social planners hoping to avoid the same types of problems. For example, the lack of basic amenities, such as shops, sports and other recreational grounds and cinemas, poor transport links etc. Housing was mainly of the two/three bedroom tenement type, off a common close. The lack of variety of housing types, such as detached and semi-detached house types created a somewhat monotonous and bland townscape. This along with a lack of any stable pre-existing community structure and unemployment in the area contributed to the rise of youth gang culture. This became so notorious in the 1960s that celebrities including Frankie Vaughan became involved in community issues in an attempt to bring order and attract resources to the area. The late 1960s and 1970s saw the construction of a large indoor shopping centre, later named Shandwick Square, local area shops, Easterhouse Library, pool and community centre, local schools (both primary and secondary) churches and in the early 1980s, the health centre (GP surgery and dentist). Since the early 1980s, Glasgow City Council and more recently Glasgow Housing Association began a programme of renovation, demolition and refurbishment of the housing stock, replacing the old style tenement housing with detached and semi-detached houses. This has attracted significant amount of privately owned property and investment into the area, including the provision of better transport links and amenities. Housing is now mainly under local housing associations such as Provanhall, Easthall Park, Blairtummock and Bishops Wood. In 2016, Glasgow City Council outlined masterplans for the development of the Greater Easterhouse area over the next 20 years. Easterhouse Panthers are a rugby league team based in the area. Shopping areas include: the Glasgow Fort, which is a high street-style retail park. It has many well-known high street stores, including Morrisons Scottish flagship supermarket, several restaurants including Pizza Hut and Frankie & Benny's. The Fort has excellent transport links, being built at junction 10 of the M8. There was a smaller shopping centre, Shandwick Square, which outside of the shopping centre contains a McDonald's restaurant. Several small, village-style shopping areas are scattered throughout the suburb. There are two business parks, Glasgow and Westwood. Glasgow Business Park was built to the west of the nineteenth century village. Businesses located in the park include Home Scotland, Lovell Partnership Scotland, Real Radio, Miller Homes, MFI Distribution and Iveco Ford. Queenslie has a large industrial park. Local parks include Blairtummock and Provanhall. Bishopswood is a local nature reserve and SSI. Drumpellier Country Park lies to the east of the estate in North Lanarkshire. The surrounding countryside includes eleven sites of SSI and local nature reserves, including Craigend Moss, Todds Well, Bishops Loch LNR and Gartloch woods. Other waterways and country parks around the area include Lochend Loch, Woodend Loch, Hogganfield Loch and Drumpellier Country Park. Leisure facilities include the Easterhouse swimming pool, sports centre, library, and an arts centre in "The Bridge" (which includes a lecture hall). Easterhouse has a resident artist, sponsored by the Scottish Arts Council, with the first being Katy Dove. The area is served three primary schools - Provanhall, Oakwood, St. Benedict's, and one high school, Lochend Community High School. Glasgow Kelvin College - Easterhouse campus, forms, with the Bridge, the area's "cultural campus". In 1967, Easterhouse resident, John Fagan, had an allegedly miraculous remission of stomach cancer after praying to then Blessed John Ogilvie. After investigation by the Catholic Church, John Ogilvie was canonised by Pope Paul VI, in 1976, and he became Scotland's first saint since the reformation and for over 700 years. ^ a b "Profiles | The Glasgow Indicators Project". Understandingglasgow.com. Retrieved 15 October 2016. ^ a b "Born Abroad - Countries of Birth - Scotland - Overview". BBC. 7 September 2005. Retrieved 28 September 2008. ^ "Born Abroad - Around Britain - Overview". BBC. 7 September 2005. Retrieved 28 September 2008. ^ "Hidden history". Trondra Group. Archived from the original on 16 May 2008. Retrieved 28 September 2008. ^ a b "Bishop's country palace uncovered". BBC. 4 April 2006. Retrieved 28 September 2008. ^ "GEAAP : Welcome". www.geaap.com. Retrieved 7 July 2016. ^ "The County of Lanark from actual survey". Glasgow University. Retrieved 28 September 2008. ^ a b Murray, Robert. "The Hole and West Maryston". Monklands Memories. Retrieved 28 September 2008. ^ "Villages". Trondra Group. Archived from the original on 16 May 2008. Retrieved 28 September 2008. ^ "XXXVI. Drumpellier". Glasgow Digital Library. Retrieved 28 September 2008. ^ "Lochwood House". Mitchell Library, Glasgow Collection. Retrieved 28 September 2008. ^ a b c Historic Environment Scotland. "Auchinlea Road, Provan Hall Road, Provan Hall (Category A) (LB33863)". Retrieved 15 March 2019. ^ a b Historic Environment Scotland. "20 Baldinnie Road and Wardie Road Blairtummock House including Walled Garden and Garden House (Category B) (LB33864)". Retrieved 15 March 2019. ^ "Housing In Glasgow - East Glasgow". 7 February 2017. ^ "Modern business and conference facilities in an historical Glasgow setting". Blairtummock House. Archived from the original on 20 February 2012. Retrieved 10 May 2012. ^ "Welcome to Blairtummock House" (PDF). ^ "The House and Surrounding Area". Archived from the original on 12 July 2010. ^ Historic Environment Scotland. "Lamberton's Engineering Works, Sunnyside Road and Russell Colt Street (Category B) (LB23011)". Retrieved 15 March 2019. ^ "Interior of Blairtummock House". Archived from the original on 10 September 2011. ^ "Records of Gillespie, Kidd and Coia Architects 1956-87 - Archives Hub". ^ Historic Environment Scotland. "753 and 755 Westerhouse Road, St Benedict's Roman Catholic Church and Presbytery (Category B) (LB32159)". Retrieved 15 March 2019. ^ "WAN:: St. Benedict's Church by DTA Chartered Architects in Glasgow, United Kingdom". ^ "Easterhouse Health Centre, Glasgow - Glasgow Architecture". ^ "Wellhouse Community – Easterhouse, Glasgow - Glasgow Architecture". ^ "Easterhouse Phoenix". Archived from the original on 30 January 2011. Retrieved 28 September 2008. ^ "Rescue plan for famous local landmark". The Pathfinder. Archived from the original on 22 May 2008. Retrieved 2008-09-28. ^ "West of Scotland Archaeology Service". The Glasgow Story. 2004. Retrieved 28 September 2008. ^ McMaster, Catherine (2004). "Neighbourhoods - Greater Easterhouse". The Glasgow Story. Retrieved 28 September 2008. ^ "Easterhouse the latest Glasgow district to be transformed". The Scotsman. 28 September 2016. Retrieved 23 July 2018. ^ "Council report outlines exciting vision of the future transformation of Easterhouse". Glasgow City Council. 27 September 2016. Retrieved 23 July 2018. ^ ABACUS, Scott Graham -. "TheGlasgowStory: Saint John Ogilvie". ^ "SRSM - Memoriam Freddy Anderson". Archived from the original on 22 February 2014. ^ Dott, Graeme (2011). Frame of Mind: The Autobiography of the World Snooker Champion. John Blake Publishing. ISBN 978-1843583462. ^ Booth, Samantha (21 March 2010). "Scots actor Tommy Flanagan rocks on in Hollywood as biker gang drama takes off". Daily Record. ^ "TOMMY FLANAGAN". The Lab. ^ "A Late Rising Scottish Star in Lewis". www.netribution.co.uk. 25 August 2000. Wikimedia Commons has media related to Easterhouse. This page was last edited on 15 March 2019, at 14:30 (UTC).